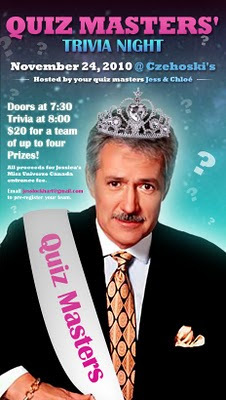 From the girls who brought you the Mobile Kissing Booth and Naked Behind Gnomes: Quiz Masters' Trivia Night Challenge. Trivia begins at 8 p.m.
$20 for teams of up to four people. Please pre-register your team. All proceeds will go to Jessica's Miss Universe Canada registration fee. She's been sprayed with chemicals so her skin isn't too light. She's sacrificed hours of personal time to get the dance moves just right. She's been cutting back on sweets so her bikini isn't too tight. But sashes are really expensive. Come compete for the crown! Bring your talent but no bikinis necessary.